Our poke cakes are always a hit, so here's one more recipe for you to try. 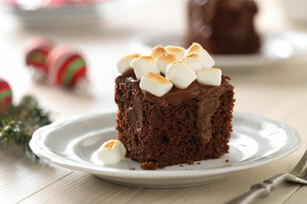 This Toasted Marshmallow-Chocolate Pudding Poke Cake features moist chocolate cake, chocolate pudding and a toasted marshmallow topping. Beat dry pudding mixes and milk in large bowl with whisk 2 min. Immediately pour half the pudding evenly over warm cake. Let remaining pudding stand 5 min. or until slightly thickened; spread over cake. Top with marshmallows. Refrigerate 1 hour. Prepare using a lemon cake mix and Jell-O Lemon Instant Pudding.